Always practical, Matt and I decided to still spend half the day catching up on some work. Once again, we decided to work in a picturesque spot at the resort. At the end of the Marina, sat a well shaded bar. With a view to the water, a gentle breeze and sand beneath my feet, it certainly wasn't the worst place to work. But it was still Valentine's Day, so Matt and I agreed to end all work by the afternoon. There was a small barbecue joint near the resort whose smells told us we had to visit. Irie Island Eats is a small food truck next to a farmers market whose menu is inspired by various flavors from the Caribbean Islands. It was definitely amazing and the sunny, tropical atmosphere made for a great date. Once we returned to the boat, we decided the day was too nice to not be on the water. We went paddle boarding for the second time, and though it was a bit windy and choppy, we had a great time on the boards. I have definitely become a fan of paddle boarding. It is a phenomenal way to get close to the wildlife and you feel wonderfully connected to the water around you. We sadly did not bring our camera's with us again, as we still need to fix up something to keep them connected to us, but I will do my best to describe everything. East of our boat was a small piece of land that jutted out from Marathon. The land acted as a shield from the wind and made for a prime area to paddle board. As we paddled along its edge, the water was shallow and clear enough to see the various fish that were settling in for the evening. Large Sardine-like fish, frightened by our arrival, jumped out of the water, a bright blue Cowfish meandered among the grass beds and a richly colored stingray flew gently around Matts' board. After rounding the corner at the end of the point, we were blasted by wind. Sitting down on a paddle board reduces your windage and makes it act more like a kayak, which is much easier to maneuver in windy weather. Though the waves often broke over my board, the water was a pleasant temperature and made for a fun ride. We set out for Rachel Key, only a quarter mile away. By this point, the key was covered in Cormorants and Brown Pelicans settling in to roost for the night. Though we tried to stay a good distance away, the birds were still put off by our arrival and flew in great flocks towards the water, momentarily surrounding us as we stood on our boards. Like the cormorants, we floated quietly on the water, watching the sun begin to set. After hanging with our feathered-friends, we headed back to a small unnamed key to the west. While the east side of the key was too windy to see much, the western side was perfectly flat and easy to get close too. It's shores were made of fossilized coral that jutted out into the water. Among these old coral formations were a plethora of oysters, gastropods and even large pink sea anemones. As the sun hit its lowest point, Matt and I began to head back to the boat. 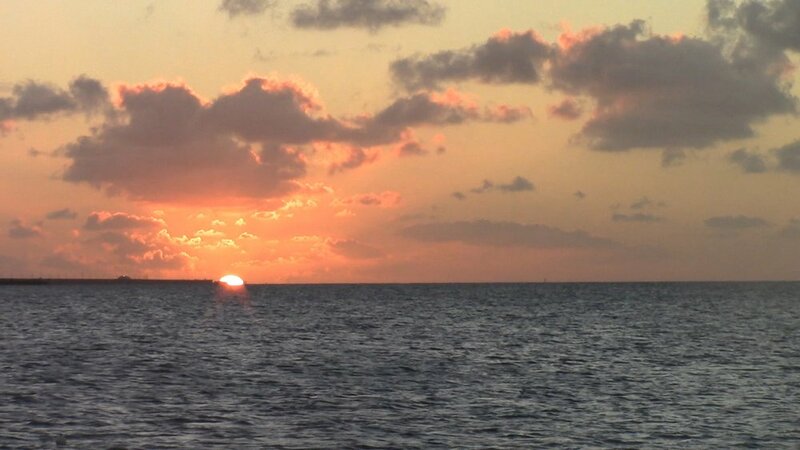 While we weren't able to catch footage of the many animals we saw, we were able to get some great footage of the perfect orange sun as it settled behind the horizon. It was a beautifully perfect way to end Valentine's. It was windy enough, that sitting was a definite necessity. I love my paddle board!! !